• The campus is set on 30 acres in Jersey City, the second-largest city in New Jersey. • New York City is 12 minutes away by PATH train. • Our remarkably diverse undergraduate and graduate student body originates from 29 states and more than 36 countries. • Approximately 3,300 students attend Saint Peter’s. • The average class size is 22 students, with a student-faculty ratio of 13:1. • Financial aid is granted to 98% of our full-time undergraduate students in the form of academic, need-based, and athletic grants. The average financial aid package is more than $20,000. • Saint Peter’s fields 16 NCAA Division I intercollegiate athletic teams. We are a founding member of the Metro Atlantic Athletic Conference (MAAC). Our MAAC championships include five titles for women’s track & field (2011–2013), the men’s basketball team’s 2011 championship, and four men’s golf team titles (2014–2017). Saint Peter’s University is the 2017 CIT men’s basketball champions. • Numerous intramural sports programs promote physical and social interaction indoors and on the fields. • More than 70 student-run organizations offer activities to complement the academic experience. • Through a number of volunteer opportunities that foster relationships with local, national, and global associations, approximately 800 students contribute more than 57,000 hours of community engagement annually. • Religious services and spiritual retreats are offered for all faiths. • Our residential urban campus offers a variety of student housing options, and 60% of students commute from the New York/New Jersey metro area. * Most majors are also available as minors. What happens when you put one of the world’s greatest teaching organizations next to one of the world’s greatest cities? You get Saint Peter’s University, a Jesuit institution of higher education just minutes from New York City, a global center of culture, entertainment, business, and professional opportunities. Saint Peter’s is one of 28 Jesuit colleges and universities in the UnitedStates and the only one in New Jersey. 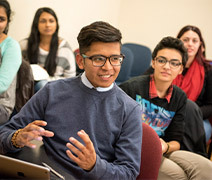 Established in 1872, Saint Peter’s University blends a unique learning experience shaped by rigorous academics, internships that provide real-word experience, community service, and a genuine, caring community that supports you long after graduation. With an undergraduate student-faculty ratio of 13:1 and a stellar faculty committed to your success, Saint Peter’s offers more than 50 undergraduate majors as well as master’s-level and doctoral degree programs. We’re small enough to know you by name and big enough to bring the world to your door. Saint Peter’s offers flexible transfer programs for students from community colleges and four-year colleges or universities. Our dedicated admission staff provide individual academic advisement to ensure a smooth transition from your current college. With Saint Peter’s, you are closer to graduation than you may think, as the University accepts up to 66 transfer credits from community colleges and up to 90 credits from four-year institutions. Saint Peter’s also has articulation agreements with a number of community colleges, which allow applicants to enroll at Saint Peter’s at a discounted tuition rate. Plus, transfer students demonstrating academic excellence may be invited to join the University’s Honors Program. The number of transfer students enrolling at Saint Peter’s continues to grow, and we want you to become a part of our student community! 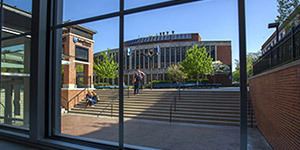 The University’s Office of Admission regularly hosts transfer days, where students are encouraged to attend for one-stop enrollment service. Saint Peter’s University is located in the heart of Jersey City, New Jersey, which provides students with unbeatable cultural experiences, plus internship and career opportunities. Being at Saint Peter’s means you are a 12-minute train ride from the heart of New York City. Gallery openings, parks, museums, shops, and shows are right at your fingertips. The other serious advantage of our location is any job, internship, or professional interest you can think of is close by. In fact, we offer several courses in the city, making it an extension of our classrooms. Whether you choose to live on campus or commute, you will enjoy the benefits of our location. Jesuit means many things to many people. Here’s what it means to us: our students come here to earn a degree but leave with so much more. They develop a desire to serve—whether it’s with a cause, an organization, or a lifelong commitment to giving back. They build an unshakeable foundation of ethics to guide their future achievements. And they build a sense of community that lasts a lifetime. Our Jesuit-based education not only prepares them for their careers but also inspires them to be caring, contributing members of society. We know that our graduates gain just as much experience outside the classroom as they do inside, which is why we make it a priority to connect students with great learning opportunities at companies, organizations, and programs worldwide. Many of our students participate in internships with world-renowned companies and organizations. Students also have the opportunity to study internationally through the Center for Global Learning or work hand in hand with faculty to conduct innovative research in various areas of study. 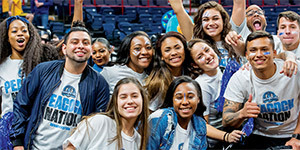 Saint Peter’s University offers students a well-rounded liberal arts curriculum, exponential career opportunities, and spiritual and service-oriented experiences within a caring, student-centered community.